This vanity looks great in our newly remodeled bathroom. The craftsmanship is terrific and is really solid. I like the way the drawers have the "slow close" feature which allows for quiet closing and no fingers slammed. The one difficulty was the faucets did not come with the vanity and it has been difficult to find fixtures which were long enough to not only go past the sink, but also prevent back splashing. 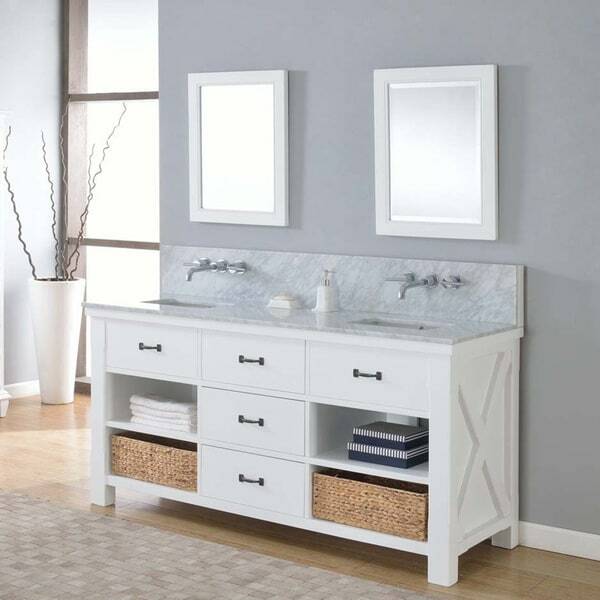 Plentiful storage space lines the bottom of this double sink vanity, making it easy to store toiletries, towels, decorative accents and more. A special patented water feature, infinity under-mount convertible sinks (US Utility Patent Pending), is included in the Xtraordinary vanity line. And it takes just seconds to convert normal under-mount sinks to infinity sinks, something you can only imagine to be in a spa. It also is made wall mount faucet ready. Providing you with a designer level bathroom without cutting open the wall, plumbing inside the wall, nor the cost of custom cabinetry/top. Please Note: Orders of 151 lbs. or more will be shipped via Freight carrier and our Oversized Item Delivery/Return policy will apply. Please click here for more information. Dimensions 70.0 In. X 25.0 In. X 36.0 In. "Is the marble top sealed?" "hi. Do I need to purchase the wall-mount valves in addition to the Danze faucets? or are the valves included?" Hello Sherry_702, the valves are not included with this cabinet. Please feel free to contact us again with any further questions. Thank you for shopping with us! "How wide are the drawers? I'm also trying to find out where the center of each sink for ruff in on the plumbing. thanks"
Hello rahn12, the drawers are approximately 21.8 inches wide. The center of each sink are approximately 41.7 inches apart from each other and approximately 14 inches from the sides. Thank you for shopping with us! "how do you install the Ptrap drain without cutting the shelves on this sink"
Hello kneobrien, you will be contacted by Customer Care regarding instructions on installing the P-trap as well as a spec sheet. Have a great day. "Is there a specific faucet that needs to be purchased with this vanity? If not can you please tell me what the spout length needs to be?" Hello bandekos, this vanity works best with a Danze faucet (ITEM# 16773092). Thanks for shopping with us! "wanted to put this on a brick wall - is the plumbing in the wall behind the backsplash?" Hello remodelma, the plumbing from the Danze faucet down to the rough in is within the cabinet. But the rough in needs to be 24-26 inches above the floor. Thank you for shopping with us!